Posted by CCLD in Horseheads, Recommendations. Here is a list of newly added or soon to be added nonfiction titles from the CCLD-Horseheads Free Library. You can search STARCat, use our Bookmyne App, or give your home branch a call to place a hold on any of these titles. Much like our non-fiction collection, this month’s “Librarian’s Picks” covers a potpourri of subjects. I hope one of these books catches your interest! 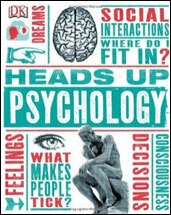 158.1 WEE Heads Up Psychology by Marcus Weeks This book offers an explanation of Psychological theories and how they relate to everyday life. The book is presented in graphic illustrations and diagrams. It should have an appeal to teens and their parents, and anyone who wants to know the basics that the field of Psychology offers. 1848-1898 by Lisa Tetrault. This intriguing book challenges the standard narrative of the history of the Women’s Rights Movement in the United States. 942.055 MOR The Time Traveler’s Guide to Elizabethan England by Ian Mortimer. The author uses diaries, letters and books re-creating a vivid portrait of daily life in Elizabethan England, from the view of both the royals and the peasants. 796.83 GEM Boxing a Concise History of the Sweet Science by Gerald R Gems. This book covers a history of the sport, including social issues and marks historic events of boxing through stories and pictures. 796.83 SMI A History of Women’s Boxing by Malissa Smith. This book traces the history of Women’s boxing from the 1700’s to the 2012 Olympic Games. It highlights the struggles, obstacles and successes of the women involved in this sport. Posted by roganp in District News, Recommendations, Steele.